The purpose of a prototype is to iron out wrinkles near the end of the design phase. 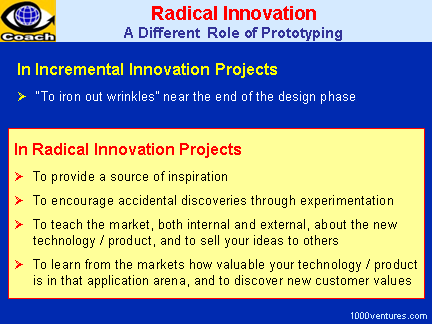 A prototype is a source of inspiration and accidental discoveries through experimentation, a mechanism for teaching the market, both internal and external, about the new technology/product and selling your ideas to others, and an instrument for learning from the markets how valuable that technology/product is in that application arena. Prototyping is a fastest way of turning a concept into reality. An → experimental hands-on try-it-out approach is invaluable to → innovation . You never know the real value of your invention until you test market it. Rapid prototyping is about building and testing new things fast. It helps you jump past endless analysis to quickly obtain a valuable → feedback. "Before there is a prototype, the ideas exists in abstract form only," writes Paul Sloane, the author of The Leader's Guide To Lateral Thinking. "It is described in words and leaves scope for misunderstanding. It is hard for the originator to convey exactly what he or she has in mind, and it is easy for people to get hold of the wrong end of the stick. Once the prototype exists then people can see and touch and feel the idea. Comments for → improvement will flow thick and fast. Whether the prototype is a model in cardboard and string or a software application consisting of a few skeleton screens with nothing behind them, it presents a framework for refinement and extension of the idea." "I decided that no harm could come from spending a few days building backbone models," said 1963 Nobel Prize winner James Watson, referring to the metal prototypes he and fellow geneticist Francis Crick used to model and test their hypotheses. "Perhaps a week of solid fiddling with the molecular models would be necessary to make us absolutely sure we had the right answer." Although their academic colleagues were skeptical of the approach, Watson and Crick's freethinking style and openness to two-dimensional and three-dimensional prototyping helped guide them toward the momentous discovery of the structure of DNA. Even Watson sometimes wondered if he was floundering. "My doodling of the bases on paper at first got nowhere. Not until the middle of the next week, however, did a nontrivial idea emerge. It came while I was drawing the fused rings of adenine on paper." James Dyson is an Englishman who invented a new type of vacuum cleaner involving a 'dual cyclone'. He built over 5000 prototypes as he battled to convince manufacturers and banks to back him. Eventually he got the backing to develop his dream and produce the first production unit. Within two years his machine was the market leader in the United Kingdom.